Returns Policy Your order is guaranteed to arrive in perfect condition at the specified shipping address provided. If you are not completely satisfied with the quality of your order upon arrival, please contact Customer Care within (30) days of receipt, with a detailed description and photograph(s) evidencing your dissatisfaction, for assistance with a replacement or exchange. We will either reship the item or replace it with another of equal or greater value. A replacement or exchange will be shipped within 5 days. Due to the perishable nature of our chocolate, all claims submitted without proper support will not be eligible for reshipment. 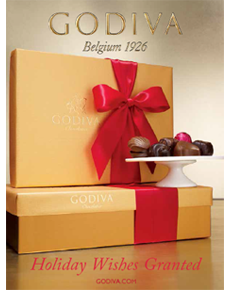 Godiva reserves the right to limit replacements. Refunds are not offered. Our guarantee extends only to correctly addressed orders. Unfortunately, and due to the perishable nature of our products, we cannot guarantee the condition of the package if the carrier must reroute your order. Godiva cannot be responsible for the condition of orders that are not able to be delivered on the first attempt (or that you may have updated or revised through any customization options with our carrier). We will ship your order to the shipping address(es) you provide. Please include a street address, and company name, suite or apartment numbers when applicable to ensure proper delivery. 3. You do not provide a corrected/new delivery address within 24 hours of the first delivery attempt. At GODIVA, we value your privacy & security.